We discuss the religious traditions (including Buddhism, Confucianism, and Daoism) and intellectual discourses (including political thought and the sciences) that have shaped visions of the world and the everyday life in East Asia for centuries; some have been rejected during modernization, but some are still alive and part of East Asian cultures. Anthropological, artistic, historical, literary, philosophic, religious, and sociological analyses of the forces of both indigenous and global cultures (in areas such as literatures, art history, music and performing arts, tourism, popular culture, and religion) are central to our teaching mission. Our program has a remarkable fullness and depth, and our strength is in the blend of humanities and social sciences, modern and pre-modern, and various approaches of cultural analysis. We believe that opening our students minds to East Asia in critical and substantive ways will equip them well for the more global and, most certainly, more Asian world we live in. We offer three undergraduate majors: Asian Studies, Chinese, and Japanese. Our graduate offerings include two kinds of M.A. degrees (Track I and Track II), as well as a Ph.D. degree in East Asian Languages and Cultural Studies. Additionally, we have a five-year B.A./M.A. program. The Department of East Asian Languages and Cultural Studies offers majors in Asian Studies, Chinese, and Japanese, together with coursework in four areas: East Asian cultural studies (involving more than one East Asian country), China, Japan, Korea, and Tibet. The Chinese and Japanese majors provide an opportunity for extensive language training and interdisciplinary coursework, fields of literature, history, and religion. The major in Chinese begins with work in modern Mandarin, the standard speech of the Beijing area, and moves on subsequently to Classical Chinese, which was the dominant literary medium until the twentieth century. The major in Japanese permits a concentrated study of the standard language of the Tokyo area and encourages an acquaintance with, Classical Japanese and Classical Chinese. Beyond language training, both of these majors focus on the humanistic fields set within a broad social and historical context. The Chinese and Japanese majors are more geographically and culturally specific than is the Asian studies major, and they require considerably more advanced language training in Chinese or Japanese. Students should examine the different majors to determine which best suits their objectives. The Chinese and Japanese majors are intended to provide preparation for graduate academic work in East Asian studies, or for careers in a wide variety of professions. Many recent majors have gone on to combine their undergraduate training with a professional degree in law or international management. Asian Studies, an interdepartmental program administered by the Department of East Asian Languages and Cultural Studies, offers an undergraduate major leading to the B.A. degree and a graduate program leading both to the M.A. and Ph.D. The undergraduate and the graduate programs enable the student to study an Asian area (China, Japan, Korea, Tibet) through two or more academic disciplines and, at the same time, to acquire at least two years of training in a language relevant to the area of study. The disciplines that contribute most to Asian studies at UCSB are anthropology, art history, literature, history, and religious studies. The languages which may be taken at UCSB in conjunction with Asian studies courses are Chinese (Mandarin and Classical), Japanese (modern and classical), Korean, and Tibetan. Interdisciplinary study of an Asian culture, together with language training, provides a good basis for graduate work at the M.A. or Ph.D. level. In addition, the Asian studies major provides specialized knowledge for students who anticipate a career in business, law, journalism, government service, or museum work. It should be noted, however, that additional training in a professional school is necessary for entrance into many of these fields. Students with a bachelor’s degree in Asian studies who are interested in pursuing a California Teaching Credential should contact the credential advisor in the Graduate School of Education as soon as possible. The Chinese program started in 1964 with the appointment of Chauncey S. Goodrich, who was joined by Kenneth H. Pai 白先勇 in 1965. The Japanese program started with Robert L. Backus in 1966. The Department of East Asian Languages and Cultural Studies was established as an independent department in 1994 with the feature, almost unique at the time, to go beyond standard emphasis on languages and literatures and to introduce instead cultural analysis as its core identity and intellectual mission and as a way to approach various aspects of East Asian cultures. As a result, cross-fertilization and interdisciplinary thinking and research became possible within our department — for the benefit of both faculty and students — in a more immediate and integral way than was possible in more traditional academic settings. Our emeriti professors include Allan G. Grapard (Japanese religions, Shinto-Buddhist interactions), Haruko Iwasaki (popular culture in early modern Japan), Bill Powell (Chinese religions), and Ronald Egan (Song literature and aesthetics). The department has grown ever since its establishment. In 2007/08, we added a Ph.D. program to our vibrant B.A. and M.A. programs. 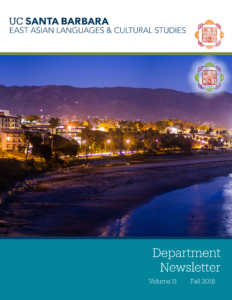 Learn more about department activities in our newsletter.